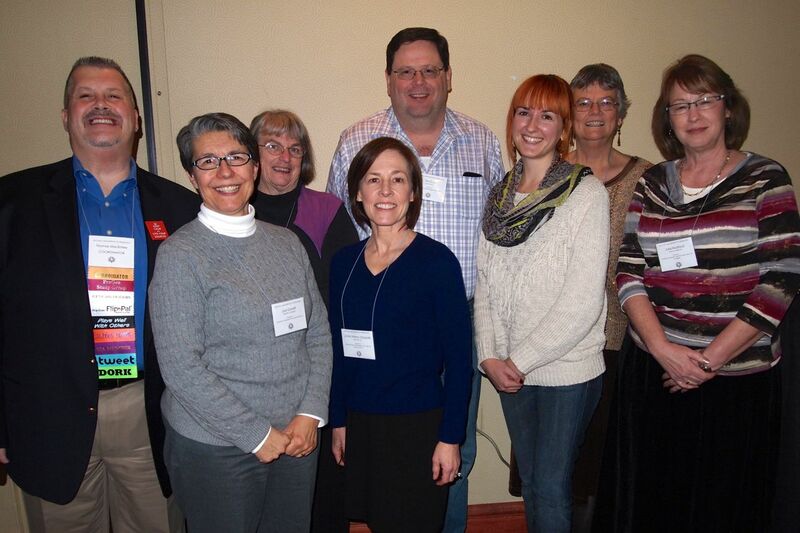 The California Genealogical Society was well-represented at the Salt Lake Institute of Genealogy (SLIG) this year. They took the time to pose for a group photo and to send me some of their observations. Our "far-flung" member from Chicago, Thomas MacEntee, coordinated a new offering this year – Course 6 – A Genealogists' Guide to the Internet Galaxy. He described the course as a "boot camp for genealogists who feel overwhelmed by technology and also have a fear of falling behind in terms of their 'tech quotient.'" Cath Madden Trindle, CG, was an instructor for Course 1 – American Research and Records: Focus on Localities, coordinated by Paula Stuart-Warren, CG, FUGA, FMGS. Cath has recently retired so this was her last teaching "gig." Lisa Gorrell attended Course 4 – Germany: Advanced Tools and Methods coordinated by F. Warren Bittner, CG. I had a great time at my second SLIG, meeting lots of people who do German research. Our class had several certified genealogists which added to the knowledge. We learned about German history and how important it is to know the history of your area. I was able to spend a couple of afternoons at the Family History Library and found an 1807 marriage record for my husband's Wollenweber line in Kusel and went back another generation! Tim Cox was enrolled in Course 9: Advanced Genealogical Methods coordinated by Thomas Jones, Ph.D., CG, CGL. I was a little intimidated going in, but on Sunday night there was a get-together and I was chatting with a lovely woman only to discover she was my co-instructor! The rest of the week was a whirlwind of information. A high point for me was the reception and banquet on the last night. I spoke with Valerie Elkins who has been helping me with my Japanese research. She introduced me to Eric Stroschien, a professional genealogist with expertise in Japanese-American internment camp records. The timing couldn't have been better. I am eager to put into use all that I learned from the Sayres, then consult with Eric before heading to Washington, D.C. in February. The Utah Genealogical Association's Salt Lake Institute of Genealogy offers a full week of instruction by national experts. Students receive at least twenty hours of in-depth instruction. The 2014 lineup of courses has been published. It's not too early to start planning for next year!